Cooking a whole filet of salmon is quite a show-stopper and special. If you want an Easy, Fancy, Deliciously Fresh Fish dish, it doesn’t get much better than baked/roasted salmon fillets, and as most of us would agree presenting a good piece of Salmon will rise to any occasion – a real centre piece. This recipe has the added touch of sheer luxury with the addition of Saffron strands to it making it even more decadent and special. I have this very easy dish that need minimal and preparation and yet one that makes a real impact when presented to the table. 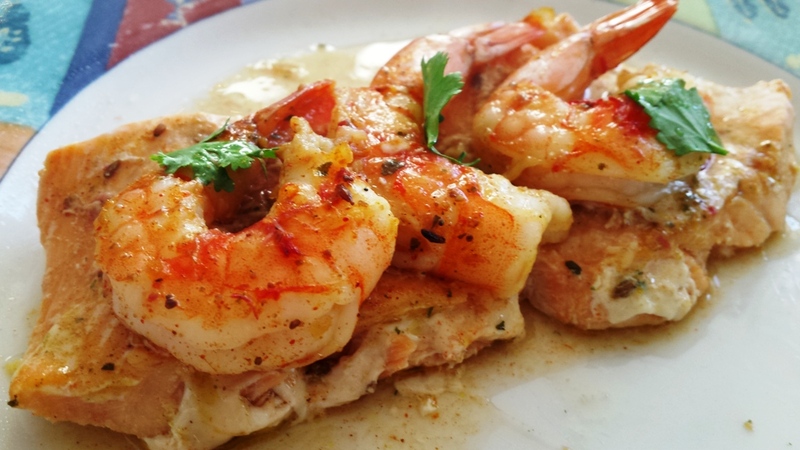 It’s a salmon fillet sandwiched with prawns or sliced mushroom and topped with beautiful sweet tomatoes and tangy lemon slices. It’s hardly a recipe if I may say, I first made this as a main course dish at a last minute dinner party, and since then it has become one dish I have kept in my back pocket. Pleasure in sharing this with you all now as I am guessing many of you are wondering what I can prepare during the festive season. Make it once and you would want to do it more often, since it’s so easy. When it comes to fish it’s best to make them less complicated as possible, and here we are doing these in the oven, so less mess and clean cooking all together. I have given you two options for this recipe, you may choose to use either Prawns or Mushroom for the stuffing – the choice is yours. If uuing prawns you will need at last 3 large king prawns per person & if you decide to go for the mushroom version you will need 250gms chestnut mushroom sliced. Few blobs of butter to scatter on top. Start by preparing the fish pat the salmon dry with a paper towel, place in a large oven dish. In a small bowl, place the saffron strands to soak in some warm water. Add the cumin, paprika, fish stock crumbled, olive oil, salt and pepper. Add a little bit of hot water to make into a paste and to dissolve the fish stock cube. Add the chopped spring onion, and half of the other fresh herbs and give it a good mix. Place one of the fish fillet in the oven proof dish, scatter the prawns or sliced mushroom (if using) on the fillet. Pour half of the spice mixture on top then sit the second fillet on top. If you wish you may tie the sandwiched fish in places to secure using a string. Drizzle some olive oil over the top and sprinkle rest of the chopped herbs. Carefully place the sliced tomatoes and lemon on top and around the fish and gently spoon the rest of the seasoning mixture on top, splash with the wine and cover with a sheet of foil. Leave to chill for up to 3 hrs or even overnight. 10 minutes before baking the fish cooking remove the marinated fish from the fridge and leave to stand at room temperature. Preheat the oven to 200°C, bake the salmon for 30 minutes. After this test if cooked by testing on the thickest side, using a shape small knife or fork if the salmon flakes easily, it’s ready. One other way to check is if you see a white milky trace on the salmon, and the fish has turned opaque, it’s ready – if the salmon is still dark pink inside it need more time to cook as it means it’s still raw. (Half way through the cooking using a long handle ladle bastes the fish with the juice as this will help keep the fish moist and juicy). 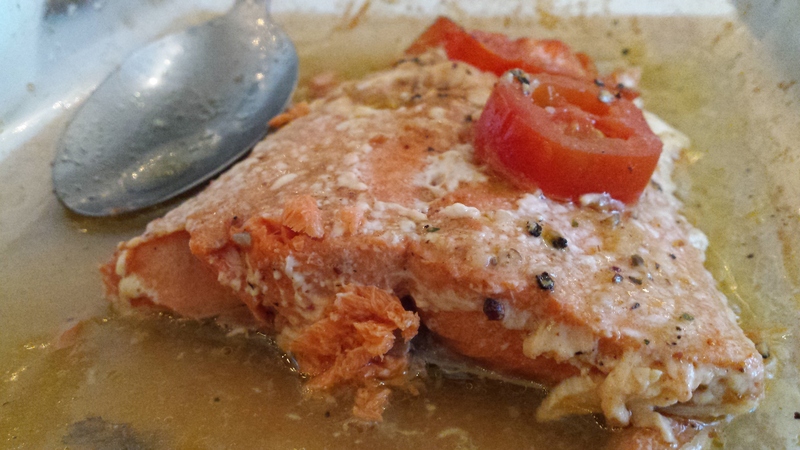 When the salmon is done, turn the oven off and serve soon after. I like to serve this fish with aromatic pilaf rice or some roast vegetables. Brinda’s Note: Tips on how to check if the fish is done, usually the thickest part of a Salmon fillet is usually about one inch thick, and to check if the fish is done it’s best to check at the thickest end. When the fish starts to flake easily with a fork and the flesh looks opaque, it’s ready. With this dish any leftover will keep refrigerated and can be eaten either gently reheated in the microwave or cold. 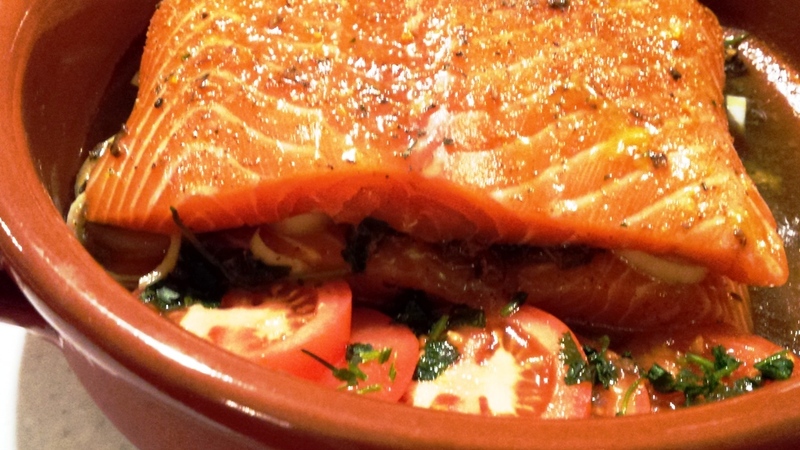 In this dish I have cooked the Salmon without the skin, since that’s how my fish supplier gets it ready for me, but cooking with the skin on is very good and taste really delicious.